Out fabulous team on our Christmas night out. Nicky is the Senior Hair stylist at Sanctuary Hair and Beauty Denny and has been with the company since it originally opened in 2010. 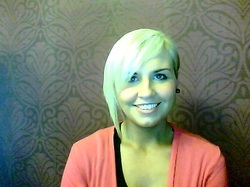 Nicky is a HNC Qualified hairdresser and has been in the Hairdressing Industry for over 10 years. Nicky specialises in all aspects of hair, restyles, hair-ups and all of the latest colours and styles. Pauline joined us in October 2018. Pauline lives in Denny and personally knows a lot of clients. Chloe joined us in October 2017 is qualified in a wide range of treatments from Shellac Nails, to Facials and Massage. Charlotte joined our team on Saturdays for assisting with Pamper Parties. To find out more about our party packages visit our Pamper Parties Page. Julie is the salon’s Managing Director and helps make the salon run smoothly on a day to day basis. Julie manages the ongoing relationships with Sanctuary’s multiple suppliers and is the main point of contact for quires from Customers and Staff. Mark is the other Director of the company and looks after all the exciting (aka boring) background stuff, such as payroll, contracts and other things that keep the salon running on a long term basis.